Trish Bird Bath by Orlandi Statuary. Since 1911, Orlandi Statuary has been hand crafting exquisite and unique statuary for the home and garden in Chicago, Illinois. Utilizing a proprietary process of mixing fiberglass, resin and stone, they create durable garden decor in fiberstone. Fiberstone is approximately 1/4 the weight of a comparable cement piece and can easily be relocated by one person anywhere in the garden. Choose from several stylish finishes to complete your garden look with a selection of planters, pedestals and benches to match. Created From Fiberstone, a Durable Weather Resistant Mixture of Sand, Fiberglass and Stone. Available in Ten Outdoor-Friendly Finishes. Has the Appearance of Aged Concrete. Suitable For Year Round Outdoor Use. Will Not Crack or Chip in Freezing Weather Conditions. Lighter Than Concrete, Can be Easily Moved. Hundreds of Matching Garden Statues, Planters, Pedestals and Urns Available. Handcrafted in the USA, Some Color Variations Will Occur. Size: 18" Deep x 18" Wide x 29 High. Shown in White Moss Finish-22 LBS. This Item Is Made To Order. 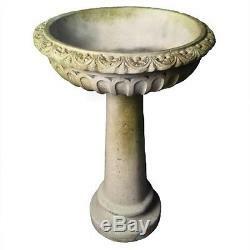 The item "Trish Outdoor Garden Bird Bath by Orlandi Statuary Made of Fiberstone FS8635" is in sale since Monday, April 28, 2014. This item is in the category "Home & Garden\Yard, Garden & Outdoor Living\Gardening Supplies\Plant Care, Soil & Accessories\Baskets, Pots & Window Boxes". The seller is "hfnshops" and is located in Chicago, Illinois. This item can be shipped to United States, Canada, United Kingdom, Denmark, Romania, Slovakia, Bulgaria, Czech republic, Finland, Hungary, Latvia, Lithuania, Malta, Estonia, Australia, Greece, Portugal, Cyprus, Slovenia, Japan, China, Sweden, South Korea, Indonesia, Taiwan, South africa, Thailand, Belgium, France, Hong Kong, Ireland, Netherlands, Poland, Spain, Italy, Germany, Austria, Israel, Mexico, New Zealand, Philippines, Singapore, Switzerland, Norway, Saudi arabia, Ukraine, United arab emirates, Qatar, Kuwait, Bahrain, Croatia, Malaysia, Brazil, Chile, Colombia, Costa rica, Dominican republic, Panama, Trinidad and tobago, Guatemala, El salvador, Honduras, Jamaica.